Do you have an iPad and wonder what in the wide, wide world of sports you're supposed to do with it? I have seen quite a few teachers who have been overwhelmed by technology overload in the classroom. Here's a new SMART Board. Oh, and how about an iPad? 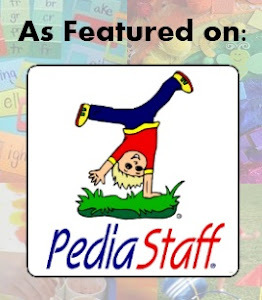 We have new curriculum and it's all online. Oh, and you're supposed to teach on top of learning all kinds of new technology! Geez! I can see why people get burned out with technology. Since we're always trying to find ways to incorporate technology and supplement what we're doing in the classroom, I thought I'd share an app that kids (and adults) can use to build upon their skills either in a one-on-one setting or independently. 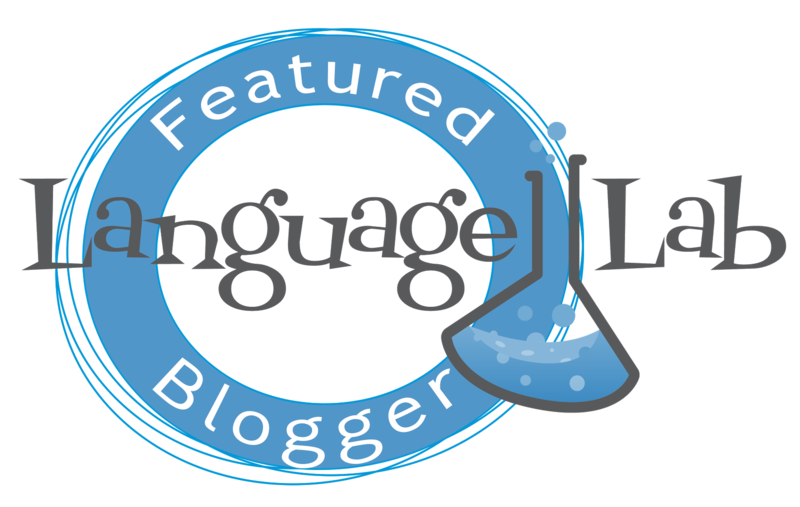 And, since I also work in nursing homes and home health care, this app covers areas that many adults are working on for cognitive language therapy. That is, however, if your nursing home lets you use iPads as a therapeutic tool. I'm still working on that one. With that said, I wanted to tell you about an app that I've been able to use with clients to practice asking and answering questions. 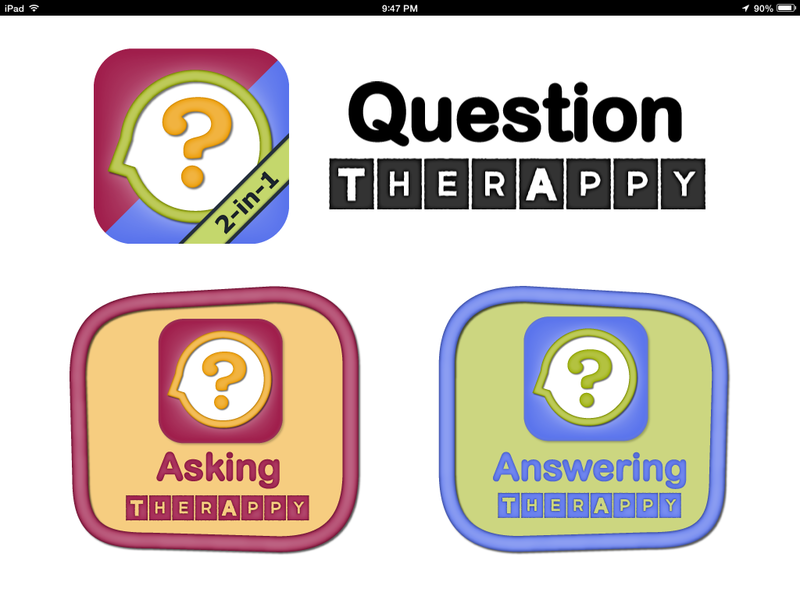 Tactus Therapy Solutions created a nice combo app called Question TherAppy 2-in-1. Both apps can be purchased individually or you can buy both with a discounted price. Answering TherAppy covers several areas that are useful such as answering "wh" questions, orientation questions, and yes/no questions. It features the ability to switch between spontaneous responses to a multiple choice option. I liked the "wh" questions because it also provides a visual picture along with auditory cues (and hints). Tactus Therapy always has therapists in mind when creating these apps as they've included a User Hub in which you can compile data and generate reports. I've found this as a big-time bonus because it's one less thing I have to jot down in therapy. The bottom line is that Answering TherAppy app works on exactly what it is intended. There really aren't any bells and whistles like dancing animals or funtime music, which might lose a kid's interest after awhile. It does, however, allow you to insert your own questions and it will ask questions about you, the user. That's pretty cool. I could see this feature as being really useful for my adult clients in the nursing homes. Then again, if you did this with kids, they would likely be motivated too. If you add Mario, Spongebob, or Star Wars questions, then you'd probably get some major interest from kids (well, my son, at least). Asking TherAppy, as you can guess, is the counterpart of Answering TherAppy. 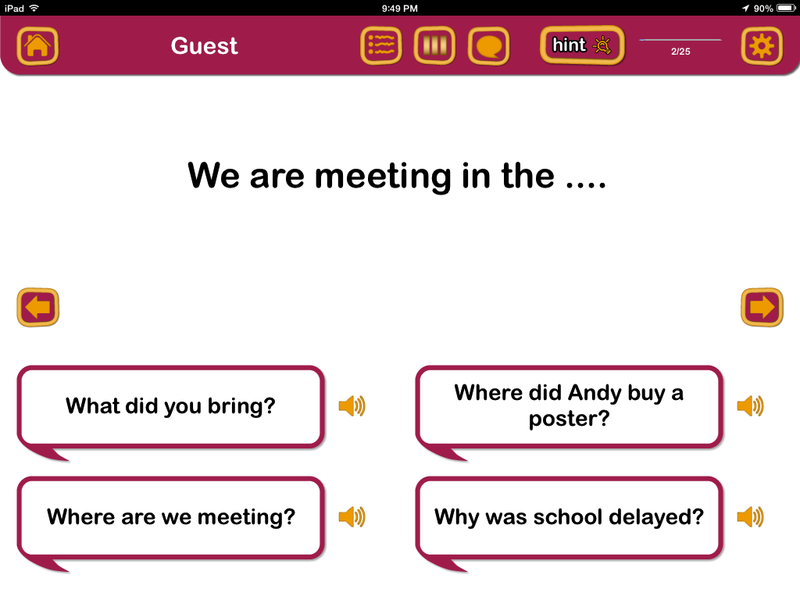 Users get to practice constructing and expressing questions when given various scenarios. The Ask Wh- section gives an opportunity to explore and investigate questions by learning about the individual parts of a question. This eventually segues into matching questions with answers. 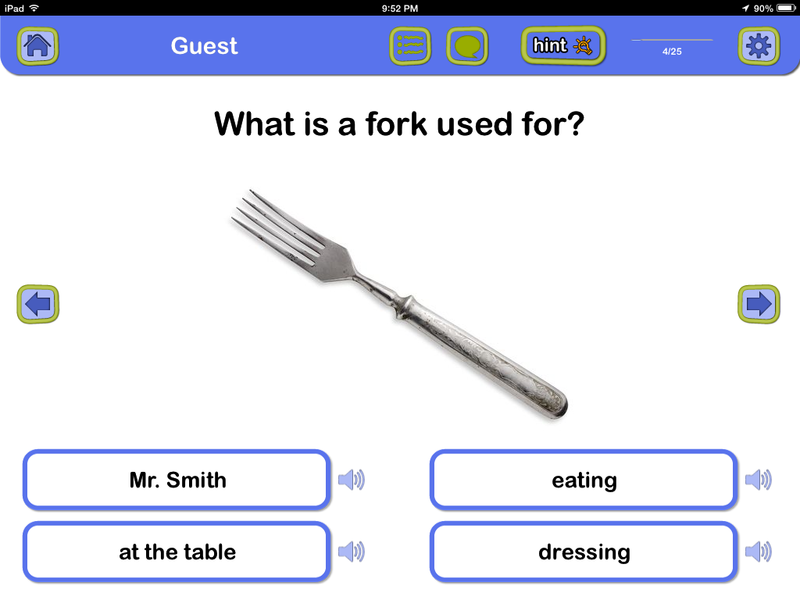 The app also features three ways to ask yes/no questions: multiple choice with auditory cues, uncued, or with a question spinner. The question spinner lets the user to generate questions by aligning the question segments. Overall, Tactus Therapy Solutions has created a nice, high-quality app for therapists. Since asking and answering questions is paramount to just about any therapy plan, this app provides therapists with a tool that should be included in their tote bags. Question TherAppy 2-in-1 is available in iTunes for $34.99. You can, however, try it free with Question TherAppy Lite in order to give it a test run before you purchase it.